Young-Hae Chang Heavy Industries, Heath Bunting, MTAA, Rafaël Rozendaal, Critical Art Ensemble, Lorna Mills and Ryder Ripps. Dot.Art is is an exhibition and events programme presenting artworks from the first wave of Net.Art alongside more recent projects produced since the rise of web 2.0, social networks and easily accessible search engines. Taking place in Vivid Projects’ physical space as well as occupying hyperlinks on its website, the Dot.Art season explores the internet as a medium and site for art from the 1990s through to the present day and includes an events series incorporating a weekly reading group, talks, performances and workshops. At 7.30pm the preview features a performance of Howl 2.0 in which Ryder Ripps re-imagines Allen Ginsberg’s classic poem for the 21st Century. Events are posted here and will include reading material, links and updates throughout the exhibition. Heath Bunting is an early pioneer of Net.Art. Since the 90s, his work has used networks and particularly the internet as a way to disrupt formal proceedings in the ‘real’ world. BorderXing Guide is a website documenting his work illegally moving between countries and providing notes on how others can do the same. Critical Art Ensemble is a collective of five tactical media practitioners of various specializations working since 1987. Their work explores the intersection of art, technology, critical theory and political activism. The exhibition will include a selection from their poster series and artist books. Lorna Mills is best known for her use of animated GIFs which have circulated widely since the rise of Web2.0 in the early 2000s. For Dot.Art she presents a pair of animated GIFs from her Money 2 series, depicting a bombastic array of imagery informed by online popular culture. MTAA are a collaborative duo formed in the mid-1990s. Their work attempts to explore networks and the institutionalised art world. 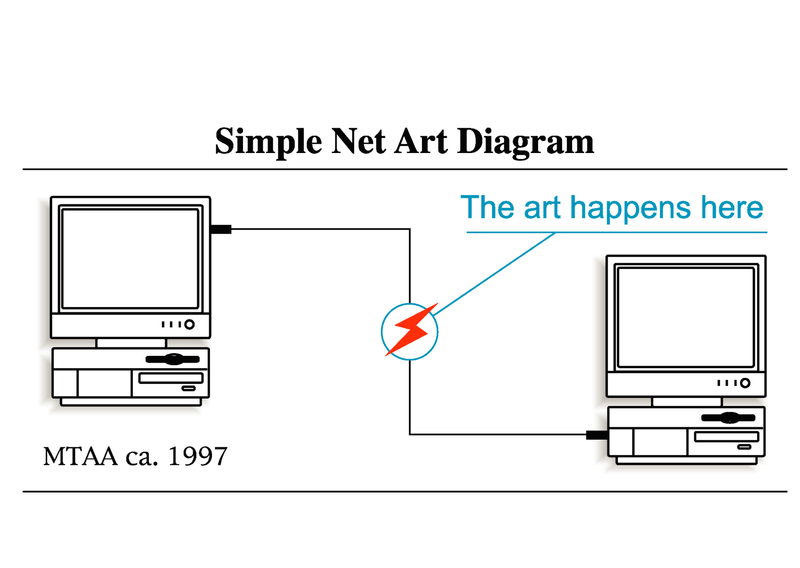 Simple Net Art Diagram seeks to contextualise the practices of artists who were working online at a time when galleries, curators and museums were not. Since 2010 Ryder Ripps has exhibited paintings, sculpture and other artworks which are directly informed by life online. During Dot.Art he will present a performance of his online poem Howl 2.0, described as “Ginsberg’s howl for the internet age”. A Dutch artist based in New York, throughout the 2000s Rozendaal produced a large number of highly colourful and occasionally interactive websites as well as developing a system which allows collectors and museums to acquire the work whilst still allowing it to circulate freely and widely online. ‘infinite thing.com’ can be compared to an online drawing which changes every time it is opened. Young-Hae Chang Heavy Industries are a collaborative duo who since the early 1990s have become known for their online, text based flash animations set to jazz soundtracks. Notes on the Downtown Eastside is a Flash animation made during a residency in Vancouver but recalls many other downtown eastsides, not least Digbeth. Dot.Art is produced by Ryan Hughes (Lead Artist at Office for Art, Design and Technology) in partnership with Vivid Projects.